The rack parts are a little less substantially attached than I expected and are a bit wobbly, but overall, this is a great space saver. I wear a women's size 8.5 and have no trouble fitting all of my shoes side by side. 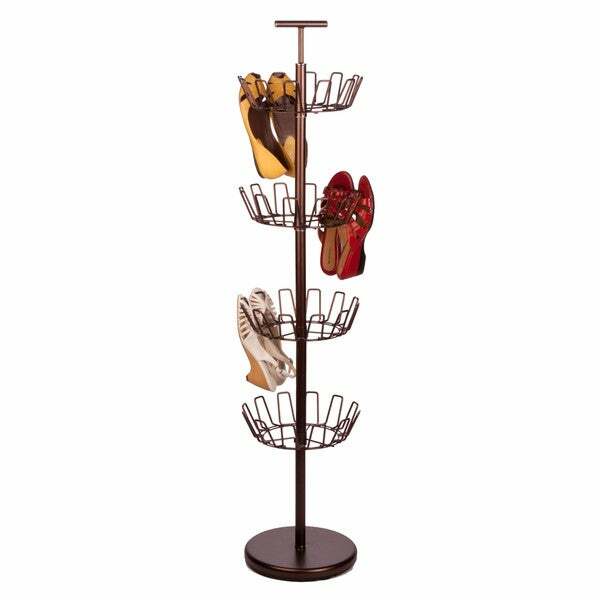 Keep your footwear organized and easily accessible with this 4-tier bronze shoe tree from Honey-Can-Do. This spinning shoe tree holds up to 24 pairs of shoes, making them easy to find. just arrived.... love love love.. I use this near my front door ! Don't have room for a traditional shoe bench! This way people can come it my house ...toss their shoes on the rack and they are off the floor and out of the way !! Looks beautiful in the Bronze. I paired it with a bronze coat Rack in the corner and place a floor plant in a cool pot between the two ! Get lots of compliments . The base is heavy and sturdy ! This shoe tree is great quality,nicely weighted for stability, great space saver, looks neat. I used this as a part of organizing a small bedroom and it made a huge difference. I would recommend to a friend. Excellent shoe tree. My daughter has so many pairs of dress shoes for work she needed to see what shoes she had and this was perfect. It holds so many pairs and is very sturdy. It doesn't take much room up either. I would definitely recommend this product for anyone that has a lot of shoes, needs to keep them organized, and wants to save space. Easy to put together and is sturdy. This shoe tree has a nice amount of space for my shoes and it was very easy to put together. I love this rack. At my home in the South I have tall and wide shoes racks that hold a ton of shoes. I was looking for something for my apartment in NY that would serve the same purpose and not take up as much space. This is it. It was easy to put together and I'm probably the least handiest person I know. I went back and purchased another one. Makes finding shoes a snap! I bought two of these. Yes, we have shoe racks and yes we have shoe boxes BUT this thing is awesome for finding and putting away your shoes! No more messy shoes lying in the floor or hunting for them on the rack in the floor. Such a nifty item and I love it! Looks great in my office/wardrobe room! had so many pairs of shoes and needed something for the room not just my closet , will be buying another one for my sandles and sneakers...what I like about this is the shelfs are adjustable to your shoe lengths and you can you the inner section for purses....Love it! Very nice shoe tree! Very sturdy and great quality! Looks very nice in the closet and not too hard to put together. Highly recommend! Well made and makes looking for the right shoe much easier. Perfect for organizing my shoes and creating space at the same time. Love it!! This was incredibly easy to put together and looks like something from a shoe store. Now I just have to get in the habit of using it. This is great in our walk-in closet! Very easy to put together and sturdy--it's been up for 8 months now. Moved into a retirement community and needed to get rid of a lot of shoe boxes for space. It is much bigger than it looks in the picture. So unless you have an empty corner in your closet or in your room it will not work for you. It is not as sturdy as I would have thought. I wouldn't tell my friends about it. "Would this work to hang hats, not caps?" It is something that I need because my space is becoming a little cluttered.